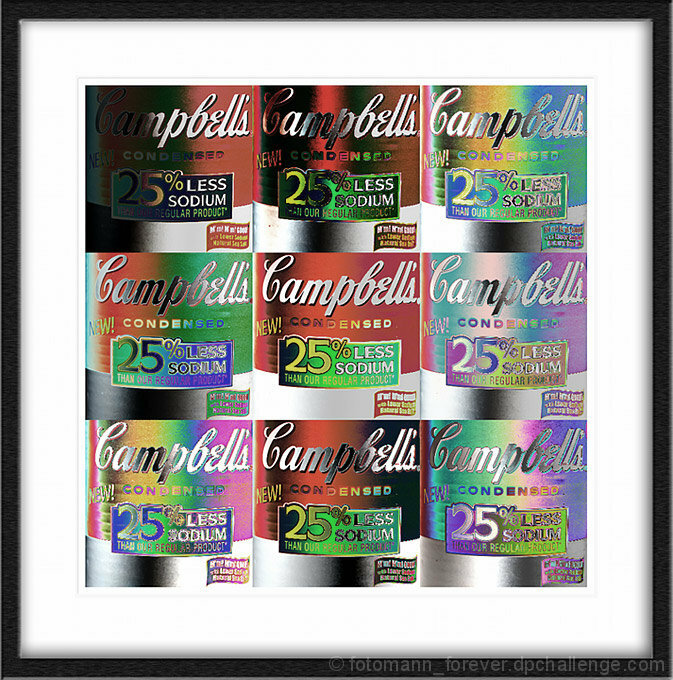 An adaption or combining of Andy Warhol's work. I'm gonna get slaughtered royally on this one, but oh well :-) I think the 25% Less Sodium with the * disclaimer is definitely a sign of our times. I thought it a fine tribute/update of Andy Warhol...gave it a seven...I'm guessing it might have scored higher if it fully filled the frame. In voting I was slanted in favor of shots that truly filled the frame. This is really good....I'm kind of wary on it for this challenge...but I really love this as a photo, or a piece of art. Great image! Although not crazy about the border. Funny, clever. I really like this. It is kind of odd, don't you think, that having completely filled the image frame with iterations of your subject in a "Fill the Frame" challenge, you have created a frame and matte around the image that are defiantly NOT filled? I don't know what to make of that, LOL. I'd like to think it's intentional, that you're playing metaphorical games with us re: the "frame" of the image itself and the "frame" of the presentation, exploring the place & presentation of art within the defined context, and all that happy hoo-hah, so I will :-) Good luck with this! Feel free to PM me if you wish, my vote is in. Proudly hosted by Sargasso Networks. Current Server Time: 04/21/2019 12:05:24 PM EDT.